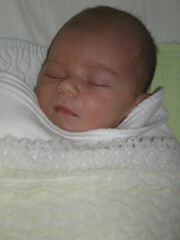 …born 14th July (Bastille Day) 2006, weighing 9 pounds 1, to Rohan and Michelle. Mother and baby doing well. Click on thumbnail to see gallery. Another nephew for me, but the first on my side of the family. It makes an uncle out of my brothers Darren and Andrew and a father out of brother Rohan.